Shame is a “learned” response with potent roots in early socialization. As children, we quickly discover that when we commit a “wrong” act, our parents react by temporarily withholding love as we are scolded, punished or shunned. Aware that we are the cause of their unpleasant reaction, we feel ashamed, scared and vulnerable. Once accepted back into our parents’ good graces, never again wanting to experience such frightening and tormenting emotions, we do our best to behave in acceptable ways. Inevitably, we commit another unacceptable misdemeanor, and desperate to avoid consequences, we deny our wrongdoing and point our fingers elsewhere. Blame is a child’s natural response for deflecting shame. Inescapably, we carry the scars of these early childhood lessons for the rest of our lives. In every relationship, at the first hint of disapproval or criticism, many adults quickly take inventory of who or what might be to blame for our imperfections or screw-up. In the absence of a credible circumstance or others to blame, we accept responsibility, most likely heaping more shame atop that ingrained in childhood. Most of us are aware that shaming and blaming are unproductive and destructive. Unfortunately, many of us are clueless when it comes to knowing how to stop hurting ourselves and others through fruitless faulting. Stumped, he never again mentioned my weight. Not taking ownership of his shaming comments was incredibly freeing. American author Lois McMaster Bujold has a quote that’s equally liberating: “Reputation is what others know about you. Honor is what you know about yourself.” When one acts and speaks with honorable intentions, outward appearances become unimportant and inward blaming dissolves into self-acceptance. 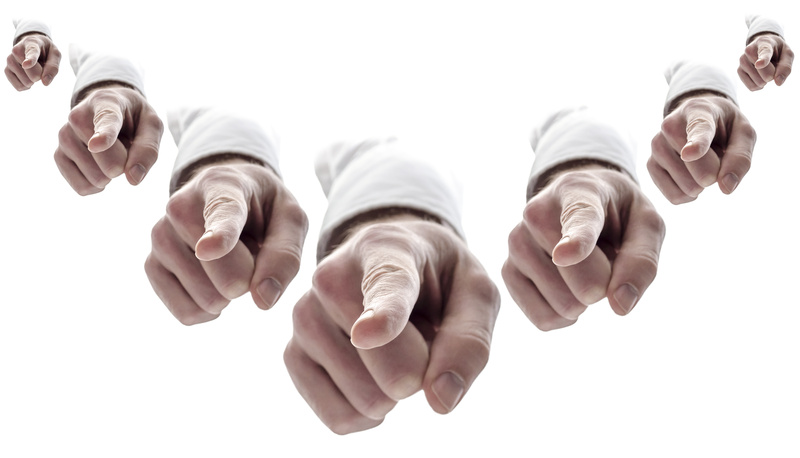 The blaming game is rampant throughout society. Most relationships—family, work and social—breed some discontent based on apparent failures and wrongdoings by one to another. Though we’re all familiar with the healing power of forgiveness, few people are capable of not condemning and blaming in the first place. I’m no exception. My knee-jerk reaction to any glaring injustice is to judge and label the perpetrator with shaming adjectives. At a recent workshop, after admitting that I couldn’t help condemning cruelties such as child and animal abuse, I asked the facilitator to shed some light on how I might become less judgemental. His answer was that judgement isn’t inherently wrong; it’s the intention behind a judgement that needs vigilant monitoring. It was an excellent observation and one that aligns with my primary self-analysis in response to negative emotions stirred by the actions or remarks of another. When upset with someone, I immediately ask myself, “What is it about this matter that bothers me? Am I feeling threatened, inadequate, jealous, insulted or ignored?” Once I’ve identified the basis for my distress, my next question is, “Where to from here?” Wanting to remain at the helm of my own happiness, I then choose either to let it go, personally work on the troublesome issue, or decide to discuss my feelings with the other person. Solution oriented, “Where to from here?” analyzing empowers me and protects my relationships with loved ones. Before reacting, I can consider desired and possible outcomes. Am I hoping for an apology? Am I prepared to know the truth? Have I processed my emotions to the point where I can set them aside and truly listen? “Where to from here?” considerations also serve me well in response to self-torment. Rather than fixating on regrets and deficiencies, I investigate attitudes and actions most likely to propel me toward pleasant outcomes, situations and states of being. The inherent gift in any joy robbing learned response is that it can be subdued through constructive reconditioning. Tamed, rather than mar anyone in muddy emotional quicksand, shame and blame trigger caring introspection and positive redirection.